The last stop on my recent visit to the Los Angeles area was Gahr High School in Cerritos, CA. Most of my school visits are going to be teacher-driven – that is, I’m choosing schools based on teachers I know or have heard about from others. Sometimes, it’s the school itself I’m interested in. And in this case, my first contact was actually with the school district, ABC Unified (which takes its name from three smaller districts that joined together in 1965: Artesia, Bloomfield, Carmenita). My day was cut a bit short as I wasn’t feeling well and had a six-hour drive to complete, but in the time that was at Gahr HS I was impressed by the energy all around this large and diverse high school, where students have some wonderful opportunities to pursue in-depth learning with enthusiastic and capable teachers. 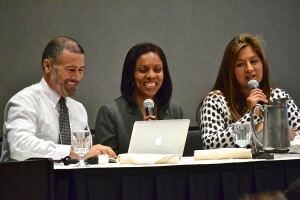 Laura Lacar (right), with two other members of the ABC Unified School District team, presenting at CalTURN (Spring 2013). 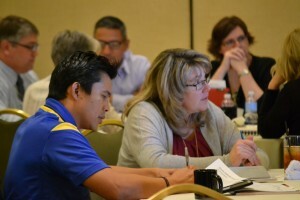 ABC Unified is among the districts currently active in the California Teacher Union Reform Network, or CalTURN. (Disclosure: I’m on the steering committee for CalTURN and also serve as the network’s virtual community organizer). A year and a half ago, a team from ABC Unified made a presentation at a CalTURN meeting, detailing how their labor-management collaboration was leading to expanded teacher involvement and leadership in their transition to the Common Core State Standards. * I was impressed by their substantive and pragmatic approach to improving teaching and learning. As I began looking for schools to visit for my project this year, I pulled out business cards of teachers I’ve met over the years, and found Laura’s among them. I wanted to see the benefits for a teacher and classroom operating in a district that puts teachers into leadership roles and helps advance labor-management relations to improve teaching and learning. Laura was kind enough to help me out in the planning, and we chose a date right after the CalTURN meeting this Fall in Southern California. Assistant Principal Larry Natividad and Principal Gina Zietlow of Gahr HS. It was no surprise to find that ABC Unified would be represented once again at the CalTURN meeting, but this year, the team was really a school-based team from Gahr High School, where Laura teaches math and engineering. Typically, district teams are comprised of union leaders and district administrators, but having a whole team from one school would certainly seems to suggest a high level of collaborative engagement and great potential for teacher leadership. 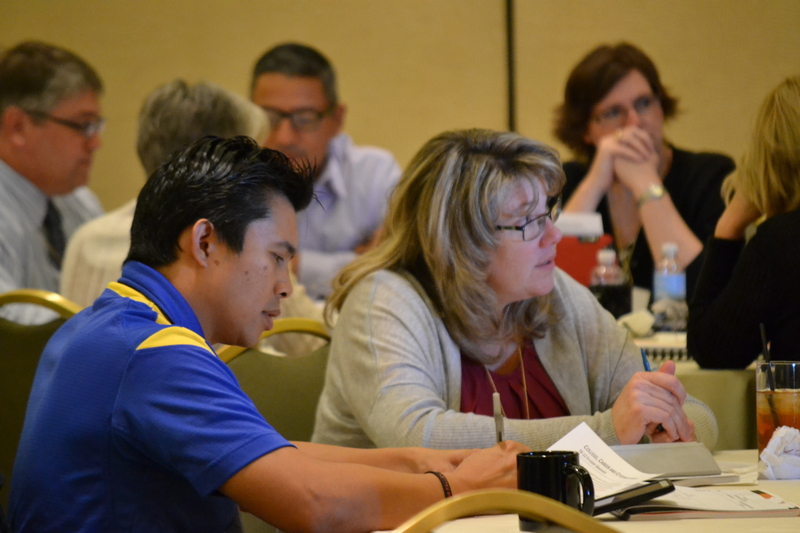 At a CalTURN meeting, you typically can’t tell the administrators from the teachers as you observe teams at work, and it’s also important to note that they are “at work” – having concrete discussions about ways to work together in districts ands schools. So when I had a chance to visit Gahr on October 14, it was great to see people in their element, putting to good use the labor-management relationships they’ve talked about and cultivated for a long time, including multiple CalTURN events. Laura Lacar welcomed me to the school before her first class of the day, and we chatted about the school and district. 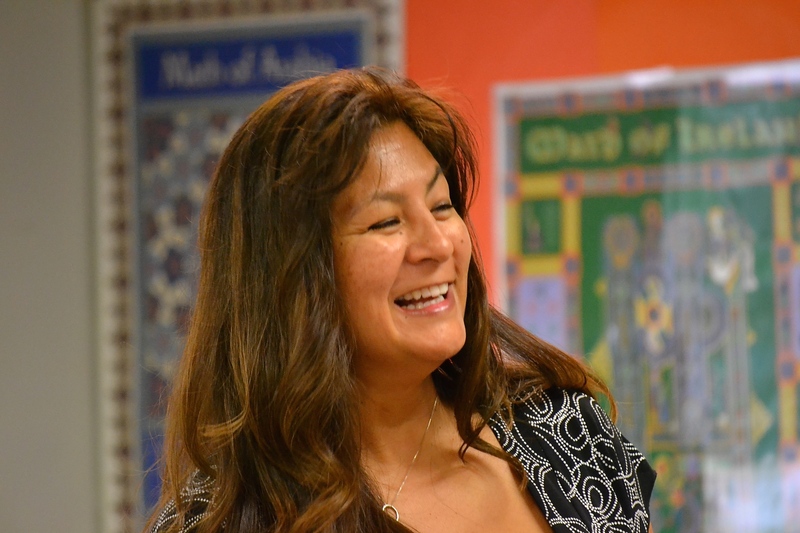 Laura used to work in another district and told me she felt a special affinity for the students there, with whom she shared a Hispanic cultural background. 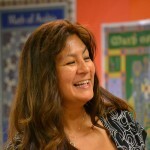 Gahr is a more diverse school – perhaps the most diverse campus I’ve ever seen – which has other advantages; however, the main strength that Laura mentioned was working with colleagues in her current job, and she made a point of putting me into a variety of classes to see her colleagues and learn more about the overall academic program at Gahr. My day started with Laura in her A.P. Statistics class. With just under twenty students, the class is a bit on the small side but fortunately able to run. For those unfamiliar with high school scheduling, you can essentially assign a price tag to every class that a school runs, and smaller classes are more expensive on a per-pupil basis. So, if your per-period cost is $15,000 and you have only 15 students, you’re spending $1000 per student on that period, but if you can get 30 students into a class, the cost-effectiveness is doubled. Of course, some classes are more specialized than others and so if enrollment is low, administrators face a decision about whether or not to run the class. Laura used a combination of real life problems and released A.P. exam questions to have students practice, and used a combination of solo practice and group discussion to allow students to try working out problems independently before talking through their thinking with a few peers. One question touched upon the topic of fast food restaurants, which provided an opening to talk about healthy eating, and the connections among food, family, and culture. It was not a major digression, but the kind of moment that allows a teacher to connect with students on a personal level and improve the relationships among members of a classroom community. Later in the day, I saw engineering classes and a portion of an art class. In each classroom, and even as I was escorted from one class to another, I encountered teachers who were proud of their work and proud of their school. I also saw the effects of school reconstitution, as an A.P. Biology teacher told me that while he likes being at Gahr, he had been similarly satisfied working in an inner-city high school prior to its reconstitution, which cost him his job and brought him to his new position. The logic of removing committed, motivated, and fully qualified teachers in order to improve a school escapes me, but Arne Duncan says it’s a good idea, and Arne Duncan is an education expert. (For more on reconstitution, see my recent EdWeek Teacher blog post about the documentary short film “Crenshaw”). You can only tell so much from a day (or most of a day) spent at a school, but Gahr High School made only good impressions during my visit. The campus is in good shape, and everyone seemed to be in a good mood in the offices, classrooms, and around campus. Everyone I interacted with was proud of the school and eager for me to see more classes, and meet more people, and follow up if I had any questions. Students that I talked to about their art and engineering classes were happy, and in the advanced engineering class that I observed, students said that they felt this particular class had influenced their ideas about college and career options. The main challenge that I learned about was trying to provide sufficient opportunities for students to take elective courses and to experience the full extent of what the school is able to offer in its academy programs. With six periods per semester, college-bound students have very little flexibility in their course of study if they’re going to fulfill all of the basic college eligibility requirements. (For the University of California and California State University systems, these requirements are commonly referred to as the “A-G” requirements, with each letter representing a subject or category of required coursework). Some schools are able to offer seven periods per semester, which increases flexibility for students, but it also means more classes, and more money. An alternative approach is to offer four classes per semester, with each one double the length and work of a regular class. This approach allows students to concentrate on fewer classes at one time and potentially have the equivalent of eight classes instead of seven. I haven’t talked at length with anyone teaching in this kind of block system, but teachers I’ve talked to about it as a possibility always wonder what happens in courses where regular practice is the most essential, like math and language study. We worry about summer learning loss for students; imagine a student who takes Spanish 1 for the first semester of freshman year but can’t get into Spanish 2 until second semester of sophomore year. Of course, precautions could be taken to mitigate such problems. I would expect that, whatever solutions and improvements might be pursued at Gahr High School, the labor-management collaboration that they have in place at the school and in the district would certainly facilitate some creative approaches, grounded in trusting relationships and a commitment to student learning. It will be interesting to see how Gahr builds upon its strengths in coming years. *I know the Common Core is a controversial issue in some corners; I’m quite sympathetic to the complaints about the standards’ development, and I’m concerned about CCSS assessment results being misused for teacher evaluation and school accountability. However, as I’ve written before regarding collaboration around CCSS, my chief concern is that we must transform the teaching profession by expanding teacher leadership in every aspect of policy and practice; I trust local teachers associations to decide what’s best for them and their students, and if CCSS is moving forward with teacher support in a given district, then teachers should be deeply involved in leadership decisions about instruction, assessment, and accountability. To keep up with my travel and writing project this year, enter your email address below. To support the work, please view my Kickstarter campaign – ends 10/22/14!